#classroom community: These powerful pop songs support any kindness and bullying prevention programs you have in place. Powerful lyrics help kids deal with bullies and stress. Songs promote tolerance of others, friendship and teamwork, and healthy self esteem. They inspire critical thinking and creative writing! BP social skills songs make a perfect addition to your classroom playlist! LYRICS INCLUDED. 11 also have simple lesson plans. General ed teachers: Use these songs for close reading and lyric study. Create a positive atmosphere in your classroom by playing them often. One teacher told us she chooses one a day! Use also for: brainbreaks, transitions, choir, talent shows, to support ANY kindness and anti bullying programs you may have in place - including ours. Music teachers: Lyrics from these songs make perfect writing prompts. They can be used to cover writing requirements for music class. Song kits for many of these songs are available in our store (a few links below.) Inspire your choir! At a time when kids are clamoring for contemporary music while many music teachers struggle to teach songs that actually TEACH, we are here to the rescue. Our songs have a proven record of pleasing kids (lyrics make them feel wise and melodies are addictively fun to sing,) while presenting enough musical "meat" for teachers to teach on. Messy - no need to over control last detail - life is for learning! Do You Wonder - a loopy little song that inspires creative poetry, puts everyone in a good mood! All songs come with lyrics. All have lesson plans except Do You Wonder. 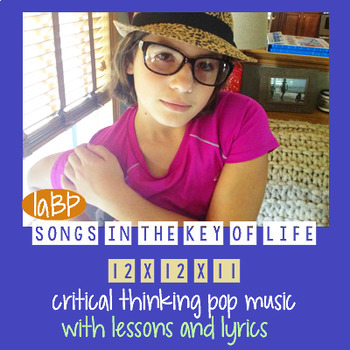 12 songs, 12 lyrics, 11 lesson plans. Lesson plans are geared towards grades 4-6 except for Enough, Barn Burn, Believe That, Messy which go up to 7-8. All are aligned with common core standards for English Language Arts. We also offer song licenses for kids to take home songs as rewards also come for general music teachers without the entire music kit.